Holy Communion (BCP) is a contemplative service with a beauty and rhythm of language comparable to Shakespeare. 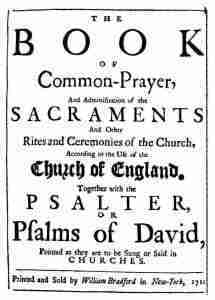 The Book of Common Prayer was published in 1662, using texts from the previous century with few changes other than the spelling, which was previously: We praise thee, we blesse thee, we worship thee, we glorifie thee, wee geue tankes to thee for thy greate glory, O Lorde God, heauenly kyng, God the father almightie. Introductory prayers, and the epistle and gospel for the day, are followed by the Creed, our declaration of faith. The service then invites us to repentance: Ye that do truly and earnestly repent you of your sins, and are in love and charity with your neighbours ..., and is followed by absolution and an outburst of praise: with Angels and Archangels, and with all the company of heaven, we laud and magnify thy glorious Name. The liturgy then moves to the heart of the mystery of God present with us in the bread and the wine. The service concludes with the blessing: The peace of God, which passeth all understanding, keep your hearts and minds in the knowledge and love of God, and of his Son Jesus Christ our Lord. Holy Communion (BCP) is celebrated each Sunday in at least one of our churches: at 0830 in Tytherington, Boyton, Heytesbury, Codford St Mary and Sutton Veny. The service at 0930 in Norton Bavant includes a sermon, and that at 0930 in Codford St Mary includes hymns and a sermon. Please see the Order of Service for Parish Communion. Matins is a non-Eucharistic service much loved by those who value the liturgy and language of the Book of Common Prayer (1662). It is celebrated once a month at Sutton Veny at 11 a.m. O come let us sing unto the Lord : let us heartily rejoice in the strength of our salvation is the message for the whole service. When the choir is present, the psalms, the Te Deum (an early Christian hymn) and Benedictus (verses from Luke ch.1) are sung. The service includes readings from the Old and New Testaments and a sermon. The hymns are traditional in nature, praising God and expressing our faith in words that have stood the test of time from the 4th century onwards. Evensong (from the Book of Common Prayer) is celebrated at 6 p.m. in Upton Lovell and Heytesbury each month, and at Codford St Mary when there is a 5th Sunday in the month. Choral Evensong on Radio 3 (Wednesdays and Sundays) is the longest-running radio programme of all, and many of us agree that ‘Evensong reaches those parts that other services don’t reach.’ It provides a time of peaceful reflection, thanksgiving, and preparation for the new week with traditional hymns, a psalm and the canticles of Mary and Simeon (from Luke ch.1) interspersed with two bible readings, prayers and a sermon.